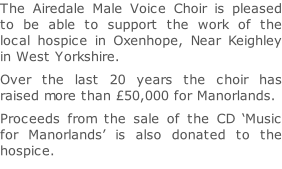 “We are extremely grateful to the Airedale Male Voice Choir for their support. 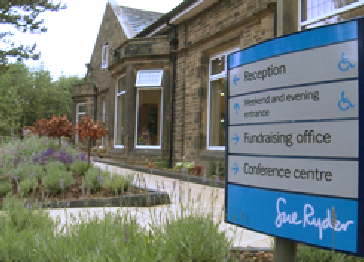 Their annual concert has raised tens of thousands pounds for us over the years. We need to raise over £1 million in voluntary contributions each year. It is therefore down to the generosity of people such as the choir, that our curial work which makes such a difference to our patients and families can continue”. Manorlands Hospice provides expert palliative and support services for family and friends. We provide care to people living with complex long-term and end of life conditions. We help those affected by cancer, multiple sclerosis, Huntington's disease, Parkinson’s disease, motor neuron disease, stroke, brain damage injury and other life changing illnesses. We hope that you’ll feel welcome and cared for at all times. There are sixteen single rooms, seven with en-suite facilities, a lounge, faith area and extensive grounds for you to use.